Sarah Uhl calls herself an artist, activist, and joy evangelist. That's quite the job description, and yet she’s pulling it off, brush stroke by brush stroke. 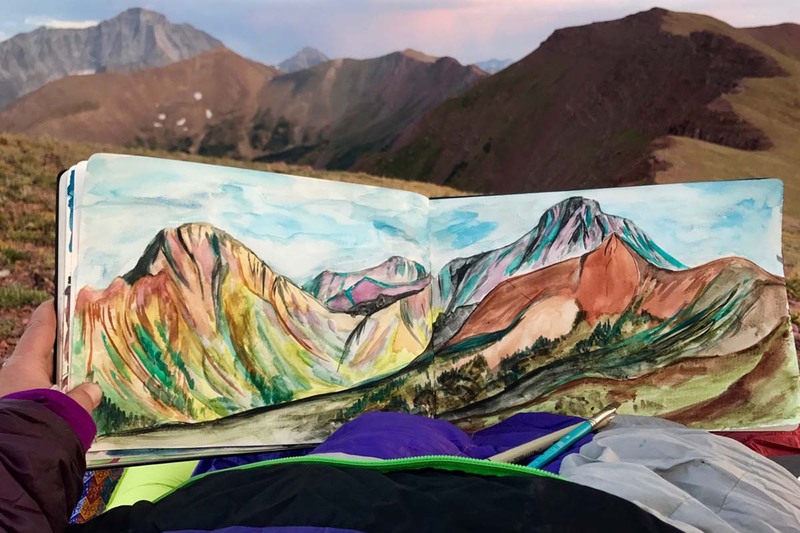 A plein-air painter from Carbondale, CO, Sarah has developed a love for her subject–the wild–that extends far beyond paychecks or paintbrushes. Through her work, she has become a voice for these quiet yet powerful landscapes. Last fall, Sarah was invited to display her art at the Banff Centre Mountain Film and Book Festival, a yearly gathering of adventurers, authors, photographers, and filmmakers from across the world. With a feather perched atop her cap and an eager bounce to her step, she generously gave us a tour of her installment that colored the walls of a bustling foyer. 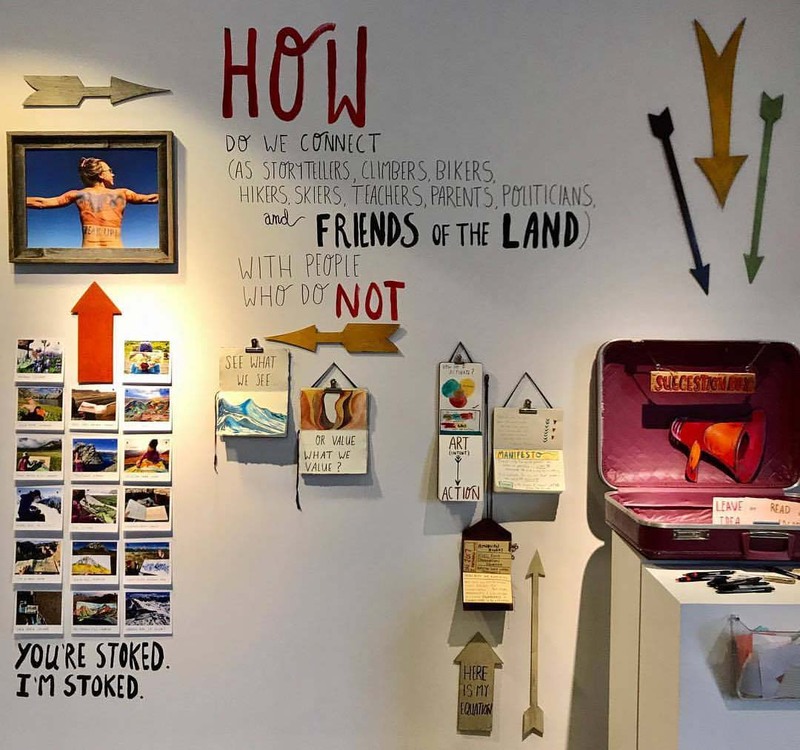 Wooden arrows led the eye from a collage of playful photos of Sarah in her favorite landscapes to a profound question strewn throughout sketchbook pages and painted on the wall. 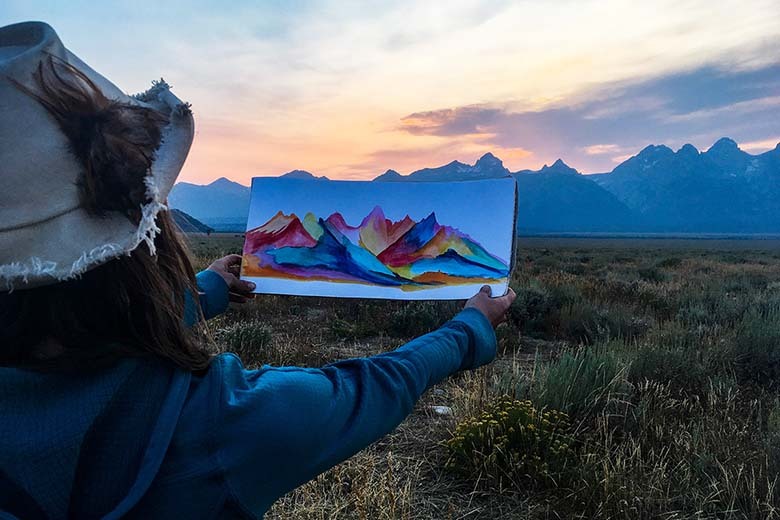 “How do we connect (as storytellers, climbers, bikers, hikers, skiers, teachers, parents, politicians, and friends of the land) with people who do not see what we see or love what we love?” In other words, how do we advocate for our wild places? The arrows dipped up and down, side to side, finally leading to a vintage suitcase where Sarah was collecting answers from her audience. We caught up with Sarah to hear her reflections from Banff, get her thoughts on activism through art, and learn about her upcoming projects. What inspired the question in your installment at Banff Centre Mountain Film and Book Festival? I realized that it was more important to me to take a question like this to Banff than it was my paintings themselves. I couldn’t stop thinking about the idea that the land needs more people to love it like we do. Most of the guests at Banff Mountain Film Festival already love the land so I realized I wanted to provoke thought and curiosity around how we can all invite more people to this beautiful party. Perhaps what the land needs more than our gushing love is for more people to gush love for it. You told me that it seemed like no one was able to answer the question you posed. Why do you think this is? You know, I’m not sure it really matters. What does matter is that the seeds have been planted and perhaps more people are thinking about this question and how it pertains to their work or their role in the bigger picture. So much of our impact is always immeasurable. My goal as an activist is to plant seeds of inspiration. From that point forward people will contribute what is most significant to their own story, not mine. That is truth and truth is power. For me, the answer is wrapped up in the little equation I made for myself that is best displayed as a Venn diagram depicting three circles: art, adventure, and activism. The place I feel most effective right now is the place where all three of these circles overlap. I love partnering with brands and organizations and part of my challenge to myself is to partner with new groups that have an impact in communities slightly outside my cozy little “outdoor industry bubble.” I would like my artwork and my story to be utilized as tools to attract new members to the outdoor tribe, not just the same old choir I keep preaching to. It’s a lot more fun, and quite easier, to keep working with my friends who do what I do and love what I love. But there is also a lot of excitement and energy wrapped up in finding new ways to be impactful with a new community that might need the sort of medicine we get from the outdoors more than we even do. What do you see as the role of art in activism? How can it affect change? I think art can solicit an emotional response in people. A whimsical painting of an outdoor landscape can trigger positive memories of a place someone used to visit, it can provoke curiosity and intrigue, and it can tell a different kind of story that allows the viewer to interweave their own personal experiences, thoughts, or feelings in a way that something more literal might not. I like applying my heart and talent to the art I make and then handing it over to advocacy organizations or campaigns that hold a bullhorn and connect with people that I couldn’t on my own. 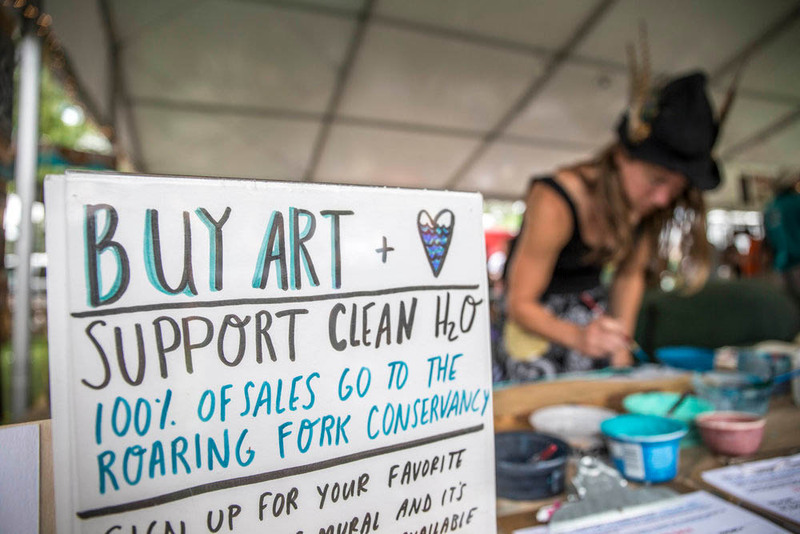 Art is a just another tool that activists can use in their daily work collecting energy, attention, and connections around important causes or issues relevant to our times. Art is a tool that can be used for connection and when you associate your art with a cause you invite others into a conversation that needs more members around the table. What have you seen work? And, what doesn’t work? I get a really positive response from people when I share photos of me painting on location. I love plein-air-style painting because art is a translation of truth. To sit beside an ancient rock tower and paint it is a way of conversing with the tower and sharing everything it’s said to me through my artwork. I think people can feel that relationship I’ve developed with the land when I share photos from my plein air painting adventures. The viewers seem to also be motivated to get out there and get to know the land in their own way also. So in a way, that works. What else works ... honesty, vulnerability and grit. I often share thoughts with my artwork—the bleeding heart behind the magic, if you will—and I get a positive response from people because of that openness. We are all so connected and people want to know they are not alone in their challenges, their grief, or their feelings of helplessness around difficult issues like the protection of public lands or climate change. Most people don’t know how they can be effective or make a difference, so when you have a voice or a soapbox (as an artists does) I think it's important to level the playing field and share that we are all in a process of figuring that out and that we all deal with the same challenges along the way. What doesn’t work? I don’t know—now you are eliciting the eternal optimist in me. I suppose the only thing that doesn’t work is apathy and avoidance. None of the causes I dedicate my artwork to have quick fixes or easy answers, but I know they need us all to be getting uncomfortable and asking big questions no matter what. So I would say that the only thing that doesn’t work is running from the questions and being lazy or unconscious about that which tugs at our heart. Listen to your heart when it calls you forward! Joyful people inspire me. Kindness inspires me. Mountains and my growing relationship with the land inspires me. What would be your dream come true for your art? Oh, I love this question. My dream come true is happening... I really love doing live art at festivals, and feel like it is a good fit for me and what I have to offer the world. 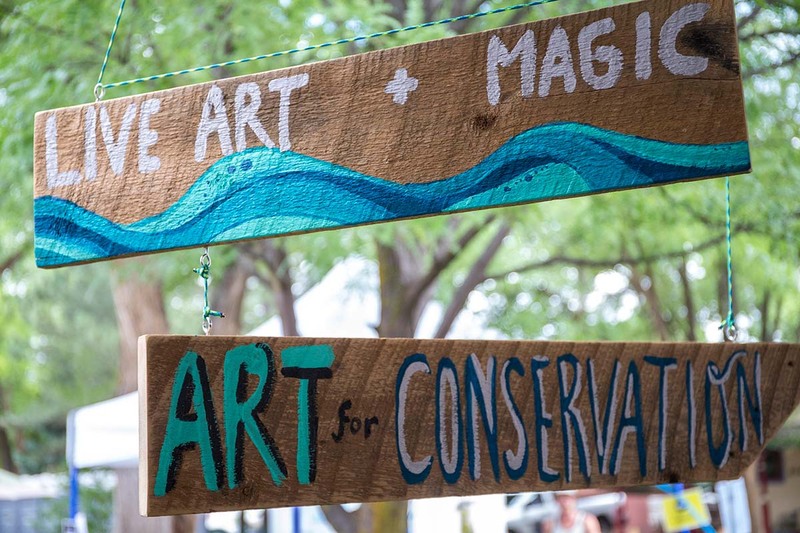 I have another live art installment at the Outdoor Retailer trade show that will benefit Conservation Colorado. 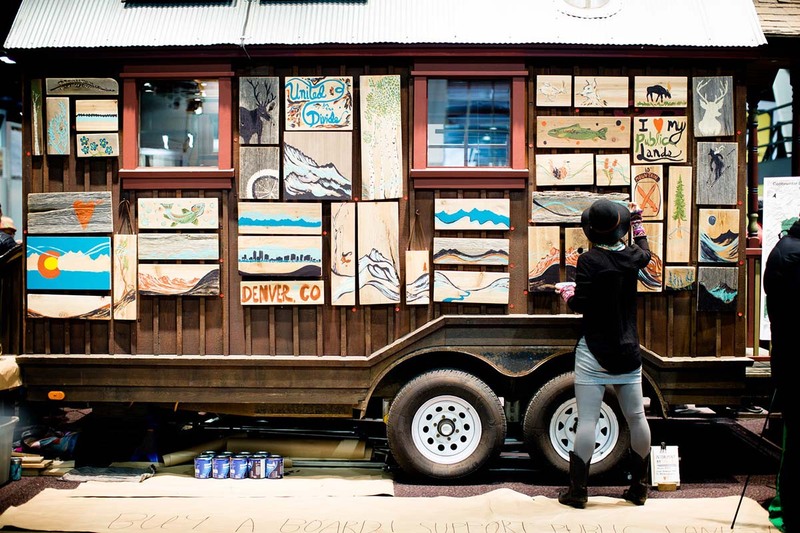 I will be doing the mural in the Outdoor Research booth on the side of the tiny house. 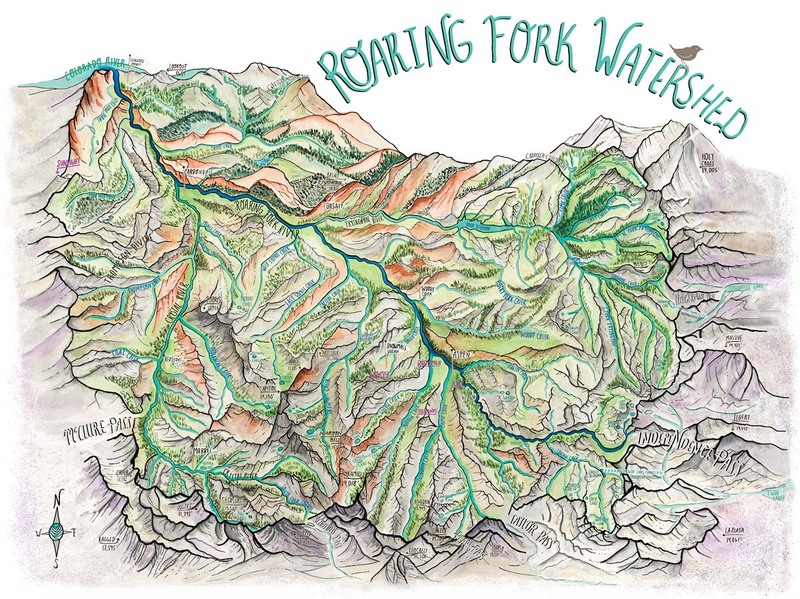 The mural will tell the story of public lands and specifically the Continental Divide Campaign that Conservation Colorado has been working so hard on lately. This is super exciting to me because it is a blend of storytelling, entertainment/engagement around public land issues, and philanthropy around a cause. Each painting will be affordable and allows more people to become advocates in a way. Follow along for more of Sarah’s art, activism, and joy on her instagram @sarahvirginiauhl, or check out her website to purchase a print or original. 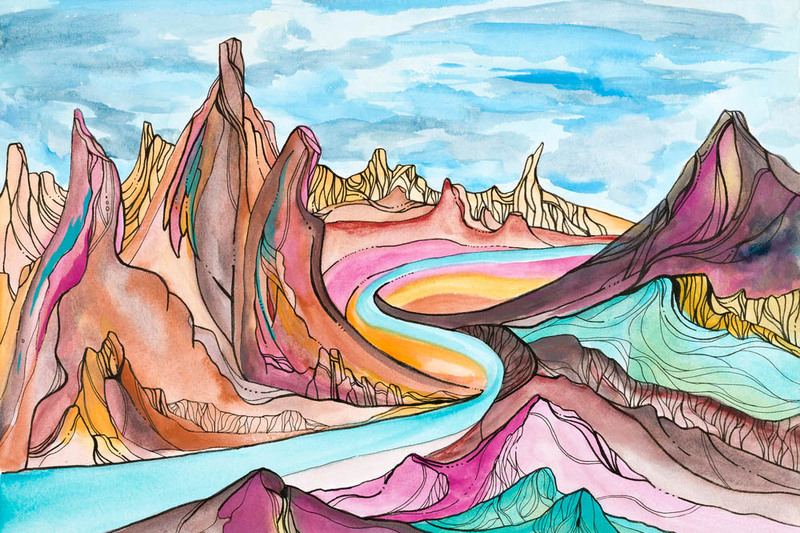 Sarah’s paintings will bring some color and playfulness to your wall, and hopefully serve to remind you of your daily role as an advocate for our cherished wilderness.